Twenty-four hour ‘Tribute to the Fallen’ will start Sunday, leading up to Memorial Day Observance at Cinco Puntos. New East Los Angeles memorial freeway interchange signs, over a decade in the making, quietly went up over the weekend ; by Monday, all five signs were up for commuters, traveling where the I-5, I-10, SR-60 and US-101 freeways meet, to see. The signs were installed without fanfare because the cost of financing an unveiling ceremony near the interchange is not feasible in these current economic times, local veterans and the representatives of elected officials said at an organizing meeting on May 20. When the interchange was officially named at the 44th Annual Memorial Day Ceremony in 1998—which included the participation of then Assembly Speaker Antonio Villaraigosa who introduced VFW 4696 Commander Dan Ortiz, then Lt Gov. Gray Davis, and now US Labor Secretary Hilda Solis — veterans expected they would soon hear the name of the Mexican-American hero on the airways as part of the daily coverage of traffic conditions along the busy freeway junction. But that was not to be the case. But on Monday, as part of an annual Memorial Day observance in East Los Angeles, the installation of the signs will be celebrated, providing closure to a 12-year struggle to finance their placement. Of the US’s 40 Latino Congressional Medal of Honor recipients, only one is from Los Angeles—East Los Angeles to be exact. The veterans at the Eugene A. Obregon American Legion Post 804 on Cesar Chavez Avenue know this well, as their Post is named in his honor, and is home of the Don Pio Pico VFW 4696, Marine Corps League Detachment 1347, American Airborn, Hispanic-American Airborne Association and the Ray Verdugo American Airborne Association. 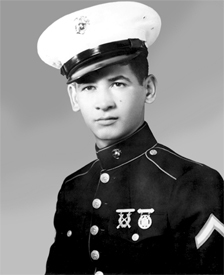 Obregon was posthumously awarded the Medal of Honor for his bravery in 1952. He was killed while saving the life of a fellow Marine in the Korean War on Sept. 26, 1950. He was just 19 years-old. “What he did was something out of the movies,” Arturo Chavez, district director for Senator Gil Cedillo told EGP during a recent planning meeting for the 63rd Annual Memorial Day Observance and 24-Hour Patriotic Vigil. 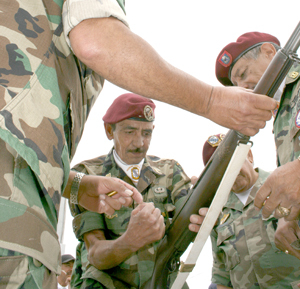 In 1997, Desert Storm Veteran Dan Ortiz and Vietnam Veteran Tomas Alvarado began a mission to have the interchange named after Obregon, Art Herrera, US Air Force veteran of the Occupational Forces in Lebanon and VFW post adjutant, and Tony Zapata, US Navy Vietnam Veteran and VFW member, told EGP. Cedillo, who like Obregon attended Roosevelt High School, introduced Concurrent Resolution 148 in the assembly to name the interchange in honor of Obregon. The resolution passed on August 28, 1998. However, the signs that were to read, “Marine Private First Class Eugene A. Obregon Interchange” never went up because the veterans were left to shoulder the cost of producing and installing the signs. According to Herrera, Caltrans wanted $24,000 for five signs, but as a non-profit organization they had difficulty raising the money. Herrera grew tired of hearing the interchange referred to as the Santa Monica junction, and a decade later, he began making phone calls to “big money groups” to no avail. While Cedillo’s office was working on the problem, Herrera decided to write Supervisor Gloria Molina a letter. “So I wrote to Molina asking her for help and then Suzanne Manriquez [senior field deputy] was assigned to this project and I told her ‘we want to raise the money,’” said Herrera, noting Manriquez’s words of kindness. “And this came from her, not because she’s here, she said ‘you know what, you veterans don’t have to pay for nothing, you veterans gave your life. You gave the ultimate sacrifice, why should you pay for it?’ And so she got in contact with Arturo Chavez and David Meza and they are the one’s who really made this thing come to what it’s going to be this Memorial Day, in honoring our fellow comrades,” he said. Herrera further credits Cedillo for getting Senate Concurrent Resolution No. 109 passed on June 26, 2008. The resolution changes the signs to read “Medal of Honor Recipient Eugene A. Obregon, USMC, Memorial Interchange.” In addition, his staff negotiated with Caltrans to have the price tag chopped in half to $12,000. The fundraising and combined efforts of the offices of Cedillo, Molina, Congresswoman Lucille Roybal-Allard and Los Angeles Councilman Jose Huizar (CD-1), shows their commitment to the veteran community, it “shows our politicians do care about us,” Herrera said. Zapata hopes the sign will help educate newcomers to the neighborhood. The veterans hope the public and the media will quickly adopt the junction’s formal name. “Considering this is L.A., rather than hearing ‘It’s all backed up to the East L.A.
Interchange’, I look forward to the traffic reports saying ‘traffic is flowing smoothly through the Obregon Interchange,’” Ortiz said. At the 63rd Annual Memorial Day ceremony and 24-hour vigil this Monday at the Mexican-American All Wars Memorial at Cinco Puntos in Boyle Heights, a replica of the freeway interchange sign will be on display. Members of the Obregon family have been invited to attend the recognition ceremony. The 24-hour vigil begins Sunday, May 30 with rotating groups of veterans standing guard, and ends at 10 a.m. Monday, May 31 with the annual ceremony. This year’s keynote speaker is Capt. Leo Cuadrado, Operation Iraqi Freedom veteran and Silver Lake area resident. The program’s emcee is CBS 2 Anchor Laura Diaz. The community is invited to bring photos of family members who have served or are currently serving to be put on display during the ceremony, Zapata said. A luncheon, hosted by the Women’s Auxiliary 804 and 4696, will follow at the Eugene A. Obregon American Legion Post 804 at 3 p.m.; the post is located at 4615 E. Cesar Chavez Ave. The memorial at Cinco Puntos in Boyle Heights is located at the intersections of Lorena, Indiana, Brooklyn and Cesar Chavez, approximately a half mile north of the Indiana Gold Line Station. For more information or to volunteer for the event, call Hector Elizalde at (323) 770-3100, Tony Zapata at (323) 261-8533 or Danny Hernandez at (323) 881-6565. June 2, 2010 Copyright © 2012 Eastern Group Publications, Inc.